Prositions Offers 30-Day Pilot Program of New DashTrain Micro-Learning Application to Organizations at No Cost | Prositions, Inc. Prositions Offers 30-Day Pilot Program of New DashTrain Micro-Learning Application to Organizations at No Cost | Prositions, Inc.
Prositions, Inc., the creators of the new micro-learning mobile app, DashTrain, recently started a free pilot program to give organizations unlimited access to their system and content for 30 days, with no limit to the number of users enrolled. 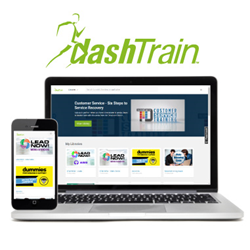 DashTrain contains over 3,000 video and audio learning bites on 20 different topics, such as communication skills, leadership, customer service, HR compliance, computer skills, and safety. Each are between two and six minutes in length and were designed with the busy employee in mind. The DashTrain application was designed for mobile devices first, with professionally produced HD quality micro-videos and audios. The application has an intuitive interface that is easy to use and a powerful predictive search engine that makes finding the right content fast and simple. Use DashTrain to complement the learning that already takes place in the classroom or via a learning management system (LMS). This performance support-style of micro-learning has been proven to enhance learning and reduce employee fatigue and mental burnout. Studies have shown a 50-65% increase of information retention and a 80-95% increase in completion rates when using micro-learning.